During a press conference held on 5th June at the club’s premises, Valletta FC presented their new signings for the season. New coach Jesmond Zerafa, assistant coach Nardu Farrugia and team manager Jesmond Zammit were announced. During a second press conference held on September at the Le Meridien Hotel, two new players were presented; these were defender Ramon Dos Santos, midfielder Denni Dos Santos, Nigerian Omonigho Temile who replaced Njongo Priso who joined AEK Larnaca in Cyprus. Other players who joined the club were Joseph Okonkwo (Dingi Swallows). Jonathan Caruana (Hibernians) and Ian Azzopardi (Sliema Wanderers). On January 28th, 24 year old Ryan Fenech joined Valletta FC, the last signing of the season was Brazilian striker Anderson Antunes Andrade, he replace Joseph Okonkwo who was released from the club. Valletta FC started the competition against Birkirkara winning with a 3-0 result. During the second match of the competition Valletta lost 2-0. Valletta FC were drawn against polish side Ruch Chorzow in the second qualifying round of the competition. The first leg was played at the Centenary Stadium on 15th July. The match ended in a 2-2 result, substitute Terrence Scerri equalised for the Lilywhites on the 75th minute. During the second leg which was played in Poland on the 22nd July, Valletta were eliminated by the away goal as the match ended in a goalless result. Ruch goalkeeper Matko Perdijic was the hero of the match as he made an incredible save on a shot by Gilbert Agius on the 92nd minute of the match, from the same corner kick the ball was cleared from the goal line and denied Valletta from becoming the first Maltese team to make it to the third round of the competition. The BOV Super Cup was played on the 21st August. Valletta met Birkirkara in the final, winning by the score 3-2; the scorers were Terrence Scerri 40’, Omonigho Temile 113’ and a dramatic goal by substitute Joseph Okonkwo 120’. The Stripes scorers were Michael Galea 81’ and Trevor Cilia 118’. The first match of this competition was against Hibernians on 19th April, Valletta moved to the semi final thanks to a goal by Denni Dos Santos on the 99th minute. In the semi-final Valletta met Tarxien Rainbows. The match had to go into extra time as the result was 0-0 after 90 minutes. A great goal by man of the match Denni Dosa Santos in the 115th minute gave Valletta the lead. On the 120th minute Ryan Mintoff of Tarxien was red carded by the referee. In front of the largest crowd of the season on 22nd May, Valletta lost the FA trophy against rivals Floriana. Valletta dominated the whole game but failed to score. Floriana scored the important goal through a free kick by Ivan Woods on the 89’ minute. At the end Tempers flared as a host of Valletta players, seemingly angered by a gesture made by Christain Cassar, pushed the Floriana midfielder to the ground. Striker Terrence Scerri and Jamie Pace were both red carded by the referee at the end of the match. 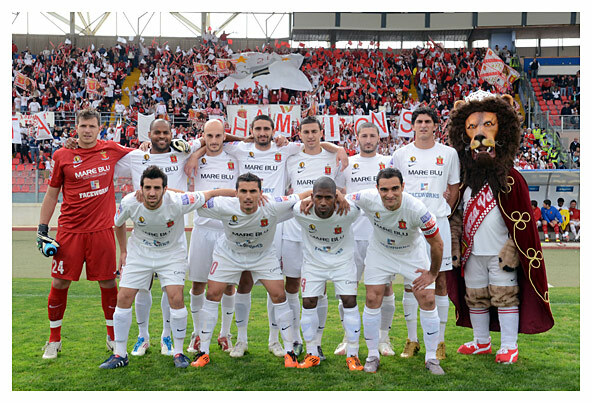 Valletta FC were crowned champions for the 20th time in their history. The Citizens were already champions for four matches from the end of the Premier League. The championship was a remarkable one as the Citizens carried a clean sheet throughout the season. This achievement is a remarkable one as no club ever won the championship without losing a game since the format of 28 Premier League matches with 3 points given after a win. The 33 games without a defeat are split in 2 UEFA Europa League matches, 1 Super Cup, 28 Premier League matches and 2 FA Trophy. The BOV Premier league kicked off on 12th September with a win against Vittoriosa Stars 3-0 and ended on 7th May with a draw against Tarxien Rainbows 2-2. Valletta won 18 matches, ended 10 matches in a draw, scored 59 goals and acquired 17, claiming a total of 42 points. Terrence Scerri was again the club’s top scorer with 16 goals. At the end of the season international midfielder Roderick Briffa was voted as the MFA Player of the Year. During the GO Malta Football Awards, Valletta F.C. won no less than 8 honours. Andrew Hogg was voted as best goalkeeper, Jonathan Caruana best defender, Roderick best midfielder, Denni Dos Santos best foreign player and best local player, Gilbert Agius best veteran player and Edmund Agius goal against Hamrun Spartans was voted as best goal. Jesmond Zerafa was voted as best coach. The club also won honours in The Gram Replay Gala Night, Jonathan Caruana best defender, Roderick Briffa best midfielder, best local player, best player of the Premier League and top star player. Denni Dos Santos was voted as the best foreign player and Jesmond Zerafa was voted as Top Star Coach. Roderick Briffa was also voted best In-Nazzjon and The Independent player and also the Public Viewers Choice Award. For the football-mad residents of the capital, two years without winning the league is a long time but the ghost was firmly laid to rest on May 7th 2011, as Valletta were crowned champions for the 20th time in their glorious history. As is their want, the supporters turned out in full force to pay homage to their heroes who, having surged into an impregnable lead at the top with three games to spare, were finally able to get their hands on the Premier League trophy. And Valletta had added reason to rejoice yesterday as their 2-2 draw with Tarxien Rainbows elevated their success to another level as they became the “invincibles” after going through an entire league campaign unbeaten. The game was low-key as the party mood made it difficult for the City players to focus on the task at hand, but credit also goes to the Rainbows who refused to get caught up in the fevered atmosphere. But, the day belonged to Valletta and their jubilant fans who transformed the enclosure into a sea of red and white. They let out a roar of joy as the referee’s final whistle echoed around the stadium, sparking wild celebrations which reached a crescendo when captain Gilbert Agius hoisted the trophy, the symbol of domestic supremacy. The delirious supporters went through their repertoire of chants as the players, technical staff and club officials, led by president Victor Sciriha, basked in their moment of glory. Eager to live up to their reputation as the most passionate supporters in Maltese football, the hard-core fans wore different costumes. Some dressed up as sailors while others wore Scottish kilts. Valletta even had three mascots cheering the fans who thronged the enclosure while others spilled into the Millennium Stand. Zerafa made two changes from the previous game with Steve Borg, back after serving a one-match ban, getting the nod ahead of Ramon and Kevin Sammut was preferred to Ryan Fenech. For Tarxien, Sergio was ruled out by suspension. As expected, coach Noel Coleiro left Orosco Anonam and Gianluca Calabretta out of the starting formation as both had three yellow cards to their name, meaning that another caution would have put them out of Saturday’s semi-final. In addition to their quest to end the season unbeaten, Valletta also took to the field with the intent of doing everything in their power to help team-mate Terrence Scerri overhaul Alfred Effiong at the top of the scorers’ chart after the Marsaxlokk forward’s hat-trick in the 6-3 win over ?amrun on Friday took him two goals clear of the City forward. The Citizens set the early pace. It didn’t take them long to break the deadlock as, after 14 minutes, they were awarded a penalty when Tarxien defender Lee Galea barged into the advancing Scerri inside the box. Referee Paul Caruana pointed to the spot and Scerri converted, driving his shot low into the bottom-left corner. Scerri had the chance to reach Effiong’s tally of 17 goals when Denni picked him out with an astute pass but fired wide from an angled position. Tarxien had not shown much attacking intent in the early stages but they would have drawn level were it not for Valletta goalkeeper Andrew Hogg who touched Cristiano’s looping header over the bar. Zerafa was forced into an early substitution as Gilbert Agius’s participation was cut short by injury. The City captain was replaced by Fenech. For much of the opening half-hour, the game resembled a training session as the proceedings were devoid of intensity. The Rainbows were seeing more of the ball as the first half progressed. Their improvement reaped instant rewards as, four minutes from half-time, Julian Vella swung in a measured cross from the left and Ricardo Costa headed past Hogg. Costa’s goal shook Valletta out of the comfort zone. Barely a minute later, the champions had regained the lead, Edmond Agius flicking the ball in after getting on the end of Sammut’s inviting centre. But, just over a minute from the start of the second half had elapsed when Tarxien made it 2-2, Bueno sending a glancing header into the net from another fine Grioli cross. Bueno’s equaliser went a long way towards showing that Tarxien had no intention of lying down. As Valletta toiled to raise their tempo, the fans urged the players to increase their efforts. Denni hit wide after a one-two with Fenech and, minutes later, the Brazilian was hauled off by Zerafa who introduced striker Ian Zammit. Jamie Pace unleashed a powerful drive from a quickly-taken free-kick but the ball cannoned off the bar. Valletta did move through the gears as the second half gained pace. At the other end, Vella’s cross into the City box sparked a melee as Cristiano’s movement unsettled the City defenders but Borg deflected the Brazilian striker’s effort into Hogg’s hands. The remaining minutes offered little in the way of goalmouth action but the sight of Valletta players mounting a late charge drew a roar of approval from the City fans who reignited their celebrations when referee Caruana blew the final whistle.